Students at North Korea's premier university showed Google's executive chairman Tuesday how they look for information online: they Google it. Google's Eric Schmidt got a first look at North Korea's limited Internet usage when an American delegation he and former New Mexico Gov. Bill Richardson are leading visited a computer lab at Kim Il Sung University in Pyongyang. Other members of the delegation on the unusual four-day trip include Schmidt's daughter, Sophie, and Jared Cohen, director of the Google Ideas think tank. Schmidt, who is the highest-profile U.S. business executive to visit North Korea since leader Kim Jong Un took power a year ago, has not spoken publicly about the reasons behind the journey to North Korea. Richardson has called the trip a "private, humanitarian" mission by U.S. citizens and has sought to allay worries in Washington. North Korea is holding a U.S. citizen accused by Pyongyang of committing "hostile" acts against the state, charges that could carry 10 years in a prison or longer. Richardson told The Associated Press he would speak to North Korean officials about Kenneth Bae's detention and seek to visit the American. Schmidt and Cohen chatted with students working on HP desktop computers at an "e-library" at the university named after North Korea founder Kim Il Sung. One student showed Schmidt how he accesses reading materials from Cornell University online on a computer with a red tag denoting it as a gift from Kim Jong Il. "He's actually going to a Cornell site," Schmidt told Richardson after peering at the URL. Cohen asked a student how he searches for information online. The student clicked on Google — "That's where I work!" Cohen said — and then asked to be able to type in his own search: "New York City." Cohen clicked on a Wikipedia page for the city, pointing at a photo and telling the student, "That's where I live." Kim Su Hyang, a librarian, said students at Kim Il Sung University have had Internet access since the laboratory opened in April 2010. School officials said the library is open from 8 a.m. to midnight, even when school is not in session, like Tuesday. While university students at Kim Chaek University of Science and Technology and the Pyongyang University of Science and Technology also have carefully monitored Internet access — and are under strict instructions to access only educational materials — most North Koreans have never surfed the Web. Computers at Pyongyang's main library at the Grand People's Study house are linked to a domestic Intranet service that allows them to read state-run media online and access a trove of reading materials culled by North Korean officials. North Koreans with computers at home can also sign up for the Intranet service. But access to the World Wide Web is extremely rare and often is limited to those with clearance to get on the Internet. At Kim Chaek University, instructors and students wishing to use the Internet must register first for permission and submit an application with their requests for research online, Ryu Sun Ryol, head of the e-library, said. But he said it is only a matter of time before Internet use becomes widespread. "We will start having access to the Internet soon," he said in an interview last month. He said North Korea is in the midst of a major push to expand computer use in every classroom and workplace. The U.S. delegation's visit takes place as the U.S. pushes to punish North Korea for launching a long-range rocket in December. Pyongyang celebrates the launch as a peaceful bid to send a satellite into space. The U.S. and other critics, however, condemn it as a covert test of long-range missile technology, and are urging the U.N. Security Council to take action against North Korea. After arriving in Pyongyang on Monday evening, the group met Tuesday with officials at North Korea's Foreign Ministry. 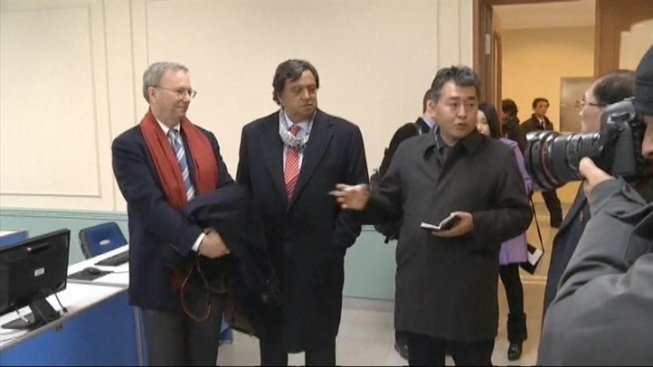 Richardson, who has traveled to North Korea several times to negotiate the release of detained Americans, was accompanied by Korea expert Kun "Tony" Namkung. He called it "a good, productive but frank meeting," but did not divulge further details about the talks. Namkung has worked as a consultant for The Associated Press. Schmidt, who oversaw Google's expansion into a global Internet giant, speaks frequently about the importance of providing people around the world with Internet access and technology. Google now has offices in more than 40 countries, including all three of North Korea's neighbors: Russia, South Korea and China, another country criticized for systematic Internet censorship. He and Cohen have collaborated on a book about the Internet's role in shaping society called "The New Digital Age" that comes out in April. Using science and technology to build North Korea's beleaguered economy was the highlight of a New Year's Day speech by leader Kim Jong Un. New red banners promoting slogans drawn from Kim's speech line Pyongyang's snowy streets, and North Koreans are still cramming to study the lengthy speech. It was the first time in 19 years for North Koreans to hear their leader give a New Year's Day speech. During the rule of late leader Kim Jong Il, state policy was distributed through North Korea's three main newspapers. There was a festive air in Pyongyang for another reason: Kim Jong Un's birthday. Though Jan. 8 is not recognized as a national holiday, like the birthdays of his father and grandfather, and his official birthdate has not been announced, North Koreans acknowledged that it was their leader's birthday Tuesday. Waitresses at the downtown Koryo Hotel dressed up in sparkly traditional Korean dresses and decorated the lobby with balloons.